ANDREA TUTTLE HAD SOME PRETTY HEFTY ENVIRO credentials when she became director of the California Department of Forestry and Fire Protection in March of 1999. 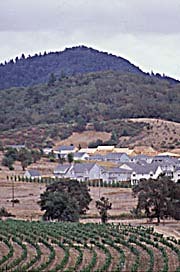 A natural resources consultant based in Arcata, Tuttle possesses a doctorate in environmental planning from UC Berkeley. 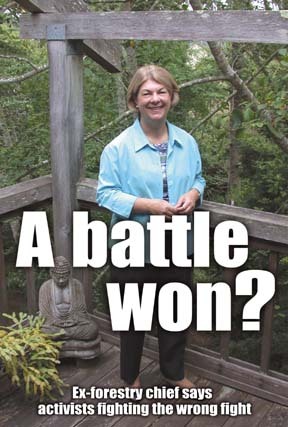 She had also served on the California Coastal Commission during the two years previous, winning rave reviews from the California League of Conservation Voters and the California Coastal Protection Network. Even so, she wasn't particularly surprised when, as CDF director, she got a hostile visit from Earth First! activists at her Arcata home one early Sunday morning in April 2000. Tuttle was in Sacramento when the group of several protesters arrived on her front lawn with buckets of Elk River mud, which they said was scooped downstream from Pacific Lumber Co. clearcuts. The group was "delivering an early-morning wakeup call" to Tuttle and other CDF officials to hold them accountable "for rubber-stamping the extinction of our salmon and killing our rivers," Earth First! member Josh Brown said in a written statement on the group's Web site. They climbed onto her roof to hang a banner, dumped the mud on her porch and smeared it on her front door. Though Tuttle was concerned for her safety and that of her husband, then Humboldt County Public Works Director Don Tuttle, she was prepared to be seen as the enemy. "That is what every [CDF] director faces. You know when you step into that job and accept the responsibilities that you need to develop a thick skin and be ready for it." Tuttle, 58, reflected this week on her five-plus years at the helm of the CDF, which ended in June when Gov. Schwarzenegger appointed Republican Dale Geldert to take her place. (See also "The Politics of Science," an earlier Journal profile of Tuttle, Dec. 10, 1998.) During her tenure in the $123,000-a-year post, she presided over some of the worst wildland fires in California history, which last fall resulted in 24 deaths in six Southern California counties -- and sparked criticism of the CDF for its decisions regarding fire response and coordination with other fire agencies. Tuttle also was responsible for ironing out the contentious permit process for Pacific Lumber's Habitat Conservation Plan (HCP), which governs logging on the company's 211,000 acres as part of the 1999 Headwaters Agreement. 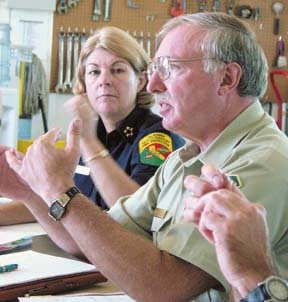 Though the firefighting role comprises the vast majority of CDF's work and uses about 85 percent of its $500 million budget, it was the agency's governance of private forestlands that made Tuttle a lightning rod for Humboldt County timber activists, whom she came to see as naive, narrow-minded crusaders who failed to recognize that the issue they were fighting over had largely been won. "We still need to make sure that the forest practice rules are well-administered, enforced and monitored, and there may be some places where we still need improvements," she said. "But, by and large, the industry is so different than it used to be -- they're restoring stream channels and fixing roads, increasing coho and wildlife protections, and now have staffs of biologists and watershed analysts. It's not the same industry, and we shouldn't keep beating them up as we used to." Moreover, the activists are ignoring the real threat -- one that has superseded that of bad forest practices, Tuttle said: Owners of timberland are breaking up their parcels and selling them off for development because they are fed up with government regulations they see as expensive and burdensome, and they're facing competition from cheaper lumber from areas with far less environmental protection. "We are losing our forestland through conversion," Tuttle said. When that happens, the land becomes host to ranchettes and "starter castles," each with its own roads, culverts, street lights, septic tanks and pets that pollute streams and destroy wildlife habitat. "This permanently destroys those very forest values that we all care about," such as broad expanses of open space, streams clear enough for fish to thrive in, and an environment that counters global warming, Tuttle said. By refusing to work hand-in-hand with timber companies, hard-core activists risk seeing what they care about the most disappear. "The alternative to good, sustainable forest management is no forests. The private forestlands will become subdivisions. And until our forest advocates recognize that, they're going to lose." Some companies are looking right now at rolling their lands out of timber production, Tuttle said, though she declined to name names. "I want to keep them here. These lands are zoned for timber production, and sustainable management into the future is a good use for California." Tuttle has a certain portion of the conservation community on her side. "We are losing forests at an absolutely unprecedented rate," Wayburn said. Half of the state's forests are in private hands, and California alone loses 60,000 acres every year, she said. "That's a huge amount of land." The reason? Owners who aren't getting enough bang for their timber buck, or for whom the "competition for using that land for something else is awfully hard to resist." Instead of remaining as forests, the land is cleared for homes, air fields or shopping malls, or turned over to agriculture; witness the transformation of the Anderson Valley -- considered at one time as a possible addition to the distant Redwood National Park -- into vineyards. The solution, Wayburn said, is to meet private forestland owners halfway -- to reward them for good timber practices while keeping the regulations strong. "We don't always want to be on the side of punishing people for doing the wrong thing," she said. "We've got a third left of the forests we had when the Europeans arrived in California. Unless we act constructively, we're just going to keep walking down the asphalt path. "I think Andrea understands that, and frankly, I think that she was bringing a new conversation to the table, to the state and private [land] owners as well as environmental activists. She was trying to lift the vision of the agency beyond the more detailed fight about whether a particular silvicultural method was the best one. She wanted people to understand the situation of the forest rather than just individual trees. You need to do both." But the environmentalists who see themselves as watchdogs for the timber industry view Tuttle's let's-work-together approach with suspicion, to say the least. 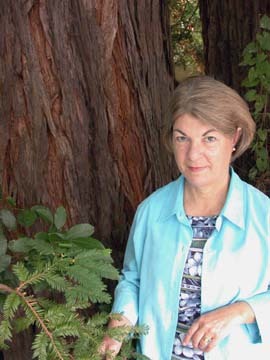 Cynthia Elkins of the Garberville-based Environmental Protection Information Center (EPIC) said the 1973 Forest Practice Act, which overhauled California's forest regulation, was prompted, in part, because the industry had been policing itself -- and doing a miserable job. But in reality, she said, corporate interests continue to dominate state policy. "It's beyond the fox guarding the henhouse. It's the fox's friend guarding the henhouse," Elkins said. "That's the sad truth about Andrea Tuttle: She only continued that legacy of CDF. "When she first was appointed, conservationists had high hopes that she was going to direct CDF in a way that would reform the terrible policies the agency had had for so many years. Unfortunately, we didn't really see very much of that. Under her direction, we saw continued clear cuts, we saw our forests continue to be completely devastated and no positive reforms in Sacramento." The agency's implementation of Pacific Lumber's Habitat Conservation Plan is a continual sore point among activists like Elkins. The idea behind the HCP was that Pacific Lumber -- in addition to selling 7,500 acres of ancient redwoods to the state and federal government in the Headwaters deal -- would work with government officials to comply with restrictions on logging in its remaining property, which serves as vital habitat for species like the marbled murrelet and the coho salmon. Tuttle said it took two or three years of meetings to agree on the fine points of how the HCP would work in real life, but its basic provisions were decided before she even set eyes on it. "The federal government had signed it and the state government had signed it. It was handed to me to implement. The CDF director has very little discretion to require mitigations that are different from the HCP." As for Elkins, her disappointment is focused at the wrong target, Tuttle said, since the HCP was drafted by three wildlife agencies and several politicians. But Elkins' comments come as no surprise. "I know that there is a group in Humboldt that is passionately anti-PALCO, and they view the world through that lens," Tuttle said. Paul Mason, a former EPIC staffer who now works for the Sierra Club in Sacramento, said he now has a better sense of the "power dynamics" around state timber policy. Tuttle's was "an extremely difficult position," Mason said. "I seriously doubt she ever would have been allowed to or was politically able to do the things that really need to happen. The political power of the timber industry is overwhelming." It has the money and the connections to get what it wants, Mason said. It's well-organized -- partly because "you can fit the owners of half of the private forests in California in an SUV," there are so few of them. And it knows how to get the pols on its side: As was widely reported, in 1999 Archie "Red" Emmerson, owner of Sierra Pacific Industries, held a major fund-raiser for then-Gov. Gray Davis at company headquarters. Mason added that although he and Tuttle were often at opposite sides of issues, he respected her. And he suspects that her job was made more difficult by virtue of the fact that she is a woman. "The Department of Forestry is very much a command and control, paramilitary-type operation," with some 90 percent men, Mason said. "I think if Andrea had all the same skills and was not a woman, she would have had an easier time of it." Tuttle responded that, with regard to the lawsuit, the CDF "never has any reason to deliberately obstruct providing information." She also said that, while some of the men within the agency were undoubtedly surprised to see a woman take the helm, they were professional and welcoming. "It's not the job of a director to sit on a fire engine. The job of a director is to defend the budget. I was successful, and gender was not an issue." As for her dealings with big timber, one industry head said Tuttle was fair. "What Andrea tried to do was to recognize that we ought to do this profession properly rather than creating a situation where we're regulated out of existence," said Neal Ewald of Green Diamond Resources, formerly Simpson Resource Co. "That doesn't mean we always saw eye-to-eye with her, but I believe she was supportive of the fact that there ought to be an industry here." With 450,000 acres in California, Green Diamond is among the five biggest timber companies. Ewald said it, like other companies, has changed over the years. "We're trying to manage the whole forest nowadays and not simply harvest trees. Our company had no biologists in 1989 and now we have up to 26, half full-time and half seasonal, collecting data. Our mantra here is we want to know more about our forest than anyone else. I think [Tuttle] appreciated the fact that we were investing this energy and money and time and talent. I think she was encouraged by it." Tuttle said she was proud to serve as head of the CDF and that she believes she made a number of positive changes there. Under her leadership, the CDF pushed for and got a civil penalties authority so that timber companies did not have to meet the much-higher criminal threshold to be punished. The department worked to strengthen coho protections after the salmon was listed as threatened. And it helped campaign for the 2000 and 2002 park and water bonds. She also worked on the forest conversion issue, an issue "that had not been well explained or developed or even recognized. I spent a lot of time with the non-industrial [landowners] trying to find regulatory processes to help them restore their land and keep their land. Very early on we set up a timberlands incentive task force. And this fall, one of the proposals that came out of that effort is going to come before the Board of Forestry: a regulatory relief proposal for non-industrials that would simplify the permit process for them if they agree to provide certain additional protections." And Tuttle said she tried to be the voice of reason in what her friend Wayburn called "a bit of a buzz saw" of a job. "There are people who don't understand the timber industry, and they have a passion that no tree should ever be cut," Tuttle said. "On the other side are the people who say, `Every tree here is my property and, government, stay out of my business.' I saw my role as the one to bring facts into the hyperbole from both sides." 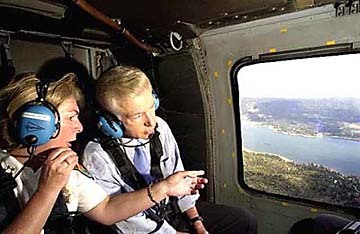 flying over the Lake Arrowhead area in 2003.
during a San Bernardino County briefing on severe fire hazard in July 2003. Now that she's back in Arcata, Tuttle said she plans to spend time at home with her husband, who has recently retired. Beginning in January, she'll teach a course in California forest and fire policy at UC Berkeley. She'll get back to some of the international forestry issues she was involved with before becoming CDF director. And she'll continue her focus on the conversion issue, working on incentives to reward good stewardship of forestland. "This is really the new wave of forestry," she said. "That's where the real action is."